Fall is in the air and we couldn't be any more excited! It might be the excellent weather, the beautiful changing of the seasons, or just the fun events and festivals, but there's no place we'd rather be than Gatlinburg in October. For visitors who want to experience this gorgeous time of year in the Smoky Mountains, we've made a handy guide for seeing Gatlinburg in October 2018! Here are the information, events, and insider tips you should know for your fall vacation in Gatlinburg, TN. 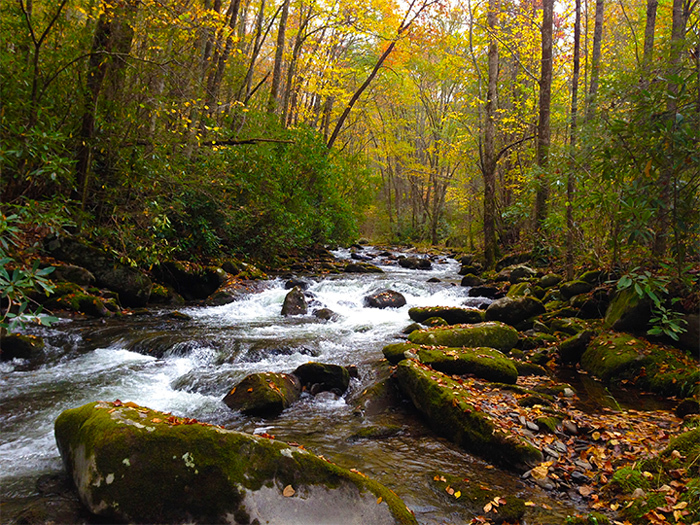 The typical weather for Gatlinburg in October is warm, pleasant days and cool, breezy nights. You'll want to pack a light coat for strolling through downtown in the evening. October is consistently the best time to see the "peak" color change in the Smoky Mountains. This year is no exception and the projected best time to see fall colors in Gatlinburg is in Mid-October. National weather patterns and other indicators signal that there will be a larger window of opportunity to see the leaves change. However, the fall leaf viewing season is easily changed by weather and other factors, so be aware that these dates are only estimates and are subject to change. Fall comes earlier to high elevation areas like Newfound Gap and Clingman's Dome. Popular hiking destinations like Mt. LeConte and Andrews Bald that are above 4,000 feet may have the best colors around the 2nd week of October. However, much of the forests in this region of the park are evergreen Spruce Fir, so fall colors may be limited. Middle elevation areas of the National Park like The Chimney Tops Hike and the Alum Cave Trail often show their full colors around Mid-October. These spots sit in the national part at elevations between 2,000 and 4,000 feet above sea level. Downtown Gatlinburg should see the peak of fall colors during this time. Other prime places to see the leaves will be lower elevation spots in the national park like the Roaring Fork Motor Trail, Elkmont, Metcalf Bottoms, Sugarlands, Tremont, and Cades Cove. Areas of the national park that are below 2,000 ft in elevation ought to peak around late October. Here's some of what you can expect when you come to see Gatlinburg in fall. As cooler temperatures come to the Smoky Mountains, there are still plenty of great activities to enjoy! Even though the daytime weather may not be right for swimming and whitewater rafting, there are still tons of things to do in Gatlinburg in October. For hiking or driving in the national park, you'll probably want to go where the colors are. If you plan on visiting in early October, head to the mountain tops by driving up to Newfound Gap. If you come to the Smokies in late October, you'll find the most brilliant colors closer to Gatlinburg. Come celebrate the changing seasons of Gatlinburg at Ober Ski Mountain! This fall festival, styled after Bavarian Oktoberfest features authentic German music, food, and dance. You'll have a screaming good time at this special themed show put on by a multi-million dollar haunted house in the heart of Downtown Gatlinburg! Ripley's Haunted Adventure takes Halloween seriously and brings out a completely new, terrifying experience for the month of October. The Mysterious Mansion is another excellent haunted house just off of the Parkway. You can even go for a ghost tour to explore the ghost stories of Gatlinburg, TN. You can see one of a kind art and handcrafted gifts on display at the Gatlinburg Convention Center. 180 craftspeople and artists come from far and wide to showcase their unique creations. Live bluegrass shows give this event a festive and fun feel while visitors browse booths and see crafts demonstrations. From 1 pm to 5 pm, guests and locals gather at the plaza outside of Ripley's Aquarium of the Smokies for fun, games, contests, inflatables, plenty of candy, and the chance to learn trick or treat safety from the Gatlinburg Police and Fire Departments. To truly experience fall in Gatlinburg and the Smokies, it's hard to beat booking your own cabin rental. Once you're relaxing on your cabin's deck in a hot tub surrounded by beautiful fall foliage, you'll see exactly what we mean. To make the most of your trip, explore these cabin rentals with mountain views. 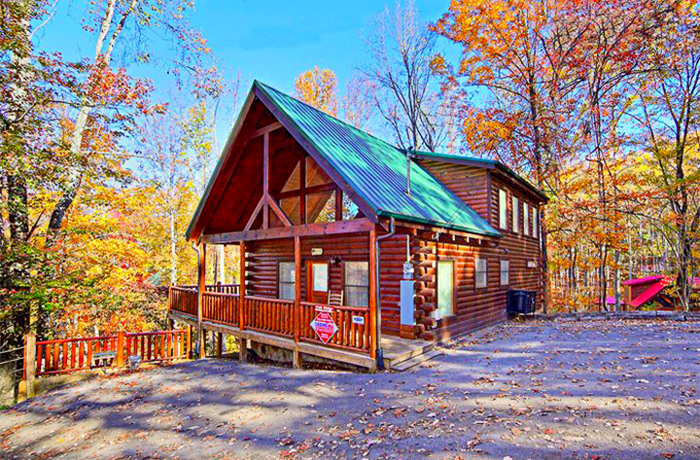 Better yet, Cabins USA Gatlinburg offers a special cabin discount in October that can help you save on your trip. A 15% discount on your nightly rate is bound to make your October vacation in Gatlinburg even more affordable! Simply reserve your cabin online or call our reservations office at (865) 436-5031 to see how much you'll save on our Gatlinburg log cabins!